The thought of returning to work following a period of maternity leave for many mothers is a daunting prospect. It is not surprising that the emotional impact on both mother and child can by high. How an employer manages the initial period of maternity leave and the return to work process for a mother is clearly a big factor in this. 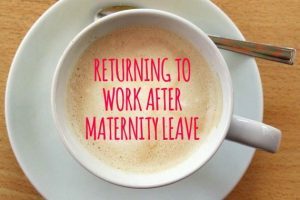 Having an organisation that can be flexible in its working arrangements certainly goes a long way in making the transition from maternity leave back into the work environment as smooth as possible. It is natural for mothers to feel anxious. The necessity for mothers to contribute to the financial burden of family life is more apparent than ever. With the added turmoil of guilt for not being with your child and the concerns around separation anxiety too it is little wonder how stressful this period can be for both mother and child. As a mother myself all of these challenges are a reality. The need to ease mothers back into the work place is an essential part of being an employer of choice. Great communication and developing a real understanding of the key anxieties the mother will be experiencing is a crucial part of this. If there is an option to enable the mother to work more flexibly then this will go a long way in reducing their anxiety and allow them to return to work in a focused and productive manner. Let us not forget that a return to work for many women can also be a very positive experience. One which allows them to integrate back into an ‘adult’ environment. It provides a sense of them being back in a situation where they are contributing to Company results rather than just catering for their baby’s needs. This can be very important to many mothers. My view on this is one of the most rewarding and valuable roles in the world is being able to nurture and care for your baby. But it is also important for many mothers to have a non-parental role that enables them to express their talents in other ways. With the help of forward thinking employers then this can be a reality for many mothers.